Samantha Power Issues Veiled Threat At POTUS Trump After McCabe Firing: "Not A Good Idea To Piss Off John Brennan"
On Friday evening, Attorney General Jeff Sessions fired Andrew McCabe on the recommendation of FBI disciplinary officials. “Both the OIG and FBI OPR reports concluded that Mr. McCabe had made an unauthorized disclosure to the news media and lacked candor − including under oath − on multiple occasions,” Sessions said in a statement. “As the OPR proposal stated, ‘all FBI employees know that lacking candor under oath results in dismissal and that our integrity is our brand’,” Sessions added. Hours later, President Trump took to Twitter to laud the move. On Saturday, Brennan lashed out at President Trump over McCabe’s firing. Is Brennan’s tweet a sign that he is anxious about his alleged role in the Steele dossier? House Intelligence chairman Devin Nunes is reportedly investigating Brennan and other Obama officials for their role in promoting the dossier. The New York Post‘s Paul Sperry says Nunes is also investigating whether Brennan perjured himself in a public testimony about the dossier. In an ominous tweet, former U.S. Ambassador to the United Nations Samantha Power, warned Trump about angering Brennan. 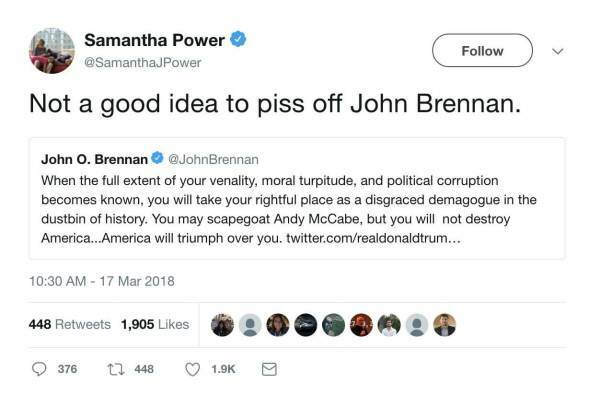 “Not a good idea to piss off John Brennan,” Power tweeted. Power’s veiled threat caught the eye of other media-types, as well. As The Gateway Pundit previously reported, former Obama administration officials are the subject of intense scrutiny in relation to Congress’ investigation into ‘unmasking’ allegations. 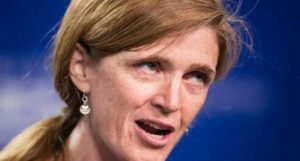 According to the Washington Free Beacon, former United Nations Ambassador Samantha Power ‘unmasked’ hundreds during her final year as an Obama administration official. Power was first identified by the Washington Free Beacon last month as a central figure in a congressional investigation into efforts by senior Obama administration officials to obtain classified intelligence information in what many allege was an effort to undermine President Donald Trump and his incoming national security team. Power is believed to be the anonymous official responsible for “hundreds of unmasking requests during the final year of the Obama administration,” according to current and former U.S. officials who spoke to the Free Beacon about the ongoing investigation. Efforts by the former Obama administration to obtain the names of Trump allies included in raw intelligence reports have fueled speculation that subsequent leaks to the press were orchestrated by the former administration and its allies in a bid to damage the current White House and smear Trump’s most senior confidantes.